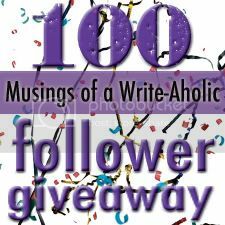 Musings of a Write-aholic: 100 Follower Giveaway! Hey everyone! I am so excited to share that Musings of a Write-Aholic is almost to 100 followers after only a little more than a month of existence! I'm so humbled and excited to be part of the blogging community, so I want to give back to all you great followers! In honor of the followers, I'm giving away a few gifts! 1 copy autographed copy of my book, BRIDGER, copies of both my books BRIDGER and FORBIDDEN in e-book format, two e-copies of my ARC, TRAITOR, and finally a $10 gift certificate. Here's the skinny, if I hit 100 followers by February 26, those will be the gifts. If I hit 150, the gift certificate jumps to $15, if we reach 200 followers, the gift certificate jumps to $20 and I'll add an additional gift: Cinder by Marissa Meyer (see my review of this awesome book here). So you see, the more followers, the more love! Simply enter below in the rafflecopter, and be sure to tweet about the giveaway each day to earn more chances to win! Thanks for creating such an amazing and huge giveaway! Congratulations on 100, now on to 10,000 more! I'm stoked about the signed copy of Bridger. Bring it on! Sorry, forgot, I'm most excited for an arc of Traitor! I'm looking forward to all of the prizes! They all sound like great options. Congrats on 100 followers, Megan! Thanks for the great giveaway. I would love to win any of the books,as they are all on my TBR list. Congrats on 100 followers!!! For sure! I don't think it'll take terribly long to hit the big 100 mark, but I'd love to have to give away more prizes for getting to more than that! :) Thanks for stopping by! Awesome giveaway! Super cool :) Hope you get your 100 followers and many more! I want the book !Thank you so very much for the giveaway! All of them sound great!! Congrats on almost 100 followers! You will be there in no time. It took me almost 4 months to get to 100. So awesome your blog is growing so quickly!! I would love to win the $10 Amazon Gift Card- which would go towards a Kindle.I've already got a copy of Bridger, so I'm looking forward to reading Forbidden and Traitor. Luv the giveaway!!! I can not wait to read your books!!! 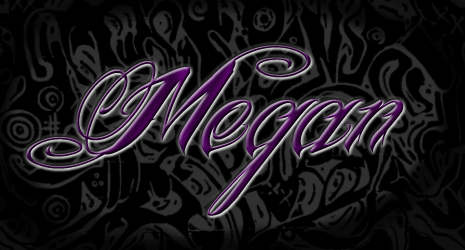 I am so happy to have found you today, Megan, as you are a new to me author! I am most looking forward to a copy of Bridger and hopefully the sequel, Forbidden, as well! Not that I'm greedy or anything, lol! I am hoping for a copy of Bridger!!! I would love to read your work! Thanks for the chance to win it! I want to win that e-arc of traitor. It's been awhile since I read forbidden but I know that I wanted badly to read more. What an amazing giveaway! And I'm definitely looking forward reading your books! I can't wait to read Tratior!! I'm definitely excited about the autographed copy of Bridger! I really want to read Bridger!! I'm looking forward to the ecopy of BRIDGER. thanks a lot for this great giveaway and Congrats on your followers!!! All the prizes are awesome but I'm looking forward to Cinder. I think I would like the any of them. They are all equally good. Thank you so much for doing this great giveaway! I would like any of them, the gift card would be nice, but so would any of the others. Signed copy of your AWESOME book!!! Omg! I don't know! ummmm..the $20 GC? I'd love a copy of Cinder! been hearing good things about it!